Fun for the whole family. 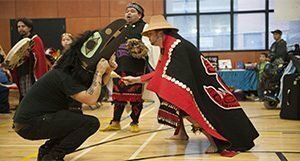 Enjoy a brilliant display of traditional and contemporary dance exhibitions from across Turtle Island featuring Kwakwakwa'wakw Urban Dance Group, Eastern Sky Ambassadors, Oceanside Dakota, Immigrant Lessons and more. Join in on the social dances! Visit the cultural artisans, vendors and Tee-pee Theatre in the exhibition hall.